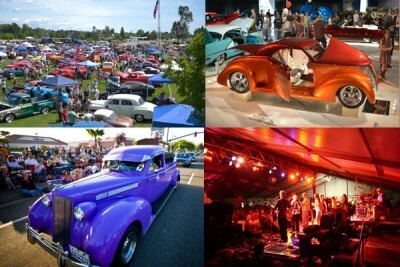 Redding, C A – December 17, 2015 – Redding, CA takes classic and vintage cars very seriously, especially when it comes to the 27th Annual Kool April Nights, April 16 – 24, 2016, offering miles of vintage cars and more events throughout the city. Held at the Redding Civic Auditorium, this annual event is one of the largest classic car festivals in California, drawing thousands of cars from around the United States and Canada. Just two hours north of Sacramento and three hours northeast of San Francisco, Redding is the hub city of Shasta Cascade and is ground zero for this spectacular 9-day event, with concerts, food, dances, and an exciting citywide Friday Nite Cruise that launches the festivities. This big event offers so many “show and shines” that every parking lot in town is loaded with vintage beauties – from 1979 and older – for the public to admire and envy. The Friday Nite Cruise, like many of the events, is free to all spectators. The sidewalks start filling early in the day, as thousands bring their lawn chairs and cameras out to stake a good vantage point before the cruise begins. When it does, custom hot rods and restored classics take over, circling central Redding and showing off their brilliant paint jobs, vintage good looks, and creative restorations. Bring the whole family: grandma and grandpa will get nostalgic, gearheads will be inspired, and kids love the pageantry of it all! Throughout the week, the “Mega Tent” outside the Redding Civic Auditorium will host special concerts featuring top-quality entertainment and plenty of classic Rock 'n' Roll, so people can dance the night away for $10 per person, per concert. Kool April Nites’ other main event is the car show at Redding Civic Auditorium, where the expansive lawn is packed with rows of cars, inviting gawkers to get up close and personal with the objects of their adoration. Meanwhile, the specialty car show, "Dreamworks," takes place inside the auditorium. This is the only place you can walk around and see all 1,800 cars, from pinstriped cruisers to Model T’s and everything in between. Online registration is now open for those who want to show off their classic car during Kool April Nites. The $50.00 fee includes entry into the Friday Nite Cruise, a parking pass and admittance into the big Saturday Car Show, as well as two all-access wristbands for the live entertainment on Friday and Saturday night. Redding is the place for exciting adventure all year long for trail seekers, paddling enthusiasts, art lovers, and fans of everything outdoors, but in April, it’s all about classic and vintage cars!